The two-day PPP Certification Program is an innovation of the Asian Development Bank (ADB), the European Bank for Reconstruction and Development (EBRD), the Inter-American Development Bank (IDB), the Islamic Development Bank (IsDB), the Multilateral Investment Fund (MIF), the World Bank Group (WBG) and part funded by the Public-Private Infrastructure Advisory Facility (PPIAF) with a shared vision of enhancing PPP performance globally. 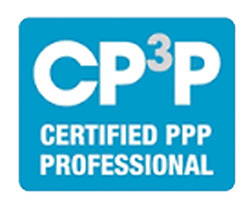 CP3P is the definitive credential to demonstrate to your peers that your abilities are aligned with international PPP good practice. CCPPP is pleased to partner with Toraza and APMG to deliver the PPP Certification Program before and after the 25th Annual National Conference. You must log in below with your username (email address) and password to register. First-time logging in or forgot your password? Click the "forgot my password" link. If your email address is not recognized, click the "create a new account" link. Registering yourself? 1) Click the "register myself" button; 2) click "add" button in the ticket option; 3) proceed to checkout or follow additional options below. Registering someone else? 1) Click the "register someone else" button; 2) Select a contact from your organization or add a new contact; 3) click "add" in the ticket option; 4) proceed to checkout. Problems registering? Contact us at 416-861-0500 or email partners@pppcouncil.ca.